Saying thank you is a small gesture, but it can have a huge impact. Sue* was a hardworking PA for a CEO of a Fortune 500 company. She was the backbone who helped the CEO to shine. Sue worked late almost every night, and was often the first to come into the office in the morning. But despite being his PA for a number of years, her efforts often went unnoticed and unthanked. The final blow came when she gave him a birthday present. She had spent her Saturday finding the ideal gift and wrapping it in his favourite colours. She left it on his desk while he was out. Later she saw him packing the gift away, so she knew he’d gotten it. However he didn’t even say thank you. Despite this, when was the last time you received a thank you message from someone you helped or connected with? You probably can’t remember. That’s because nobody sends them anymore. For most people today, thank you notes are no longer a priority like they were for our parents’ generation. As kids, virtually all of us were taught that when someone does or gives something, we always say thank you. And yet today, these two powerful words seem to have become outdated. 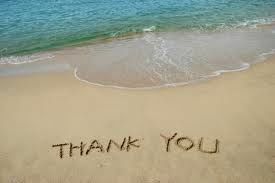 By not saying thank you, be it face-to-face, by email, in a tweet or a handwritten note, we’re missing out on a valuable opportunity to make a powerful impression and to stand out from the crowd. So why does this simple act make such an impact? 32% said they might still consider the thankless applicant but their opinion of him or her would lessen. And yet despite this, most people don’t send thank-you notes after job interviews or meetings. As an entrepreneur I’m always looking for the opportunity, and the thank-you note is exactly that. If you make the effort to send a thank-you message when your competitors don’t, you will outshine them. It’s that simple. 3. Thank you shows courtesy and respect. Sadly, in our hectic and often impolite world, we simply don’t acknowledge each other’s time, efforts and commitments any more. After an interview or meeting, sending a thank you note tells your interviewer or potential client that you appreciate that they took the time and effort to meet with you. 4. The personal touch. Technology has taken over our lives and mass messaging has become the norm. So people are increasingly starved for the personal touches like handwritten notes or thank-you cards. 5. Thank-you notes will help them remember you. After a job interview, send thank-you notes immediately to each person you’ve interacted with in the interview process. This strengthens the impression you’ve made in the interview and keeps you top-of-mind. Make it easy for them to decide on you. 6. Want better word of mouth marketing? Try saying thank you. Effective online word-of-mouth marketing centres on identifying and nurturing your most loyal brand evangelists. This is according to Eileen Bernardo, PR/Communication Manager at social media intelligence and management company Viralheat. Even small acts such as saying thank you for their support can pay big returns if you target the right people, the influencers, Bernardo clarifies. “If they are already talking about you often, it’s likely they will publicly support the brand if you reach out to them personally with a simple gesture of gratitude like a thank-you note or a discount voucher for their next purchase,” she writes. 7. A thank-you note allows you to recap points made during the interview or meeting. Have you ever left an interview wishing you’d more strongly stressed a certain skill or experience that the employer was looking for? A thank-you note gives you the chance to do exactly that. After thanking them, you can touch again upon the key points you made. Use a similar strategy to expand upon or clarify any responses that were weak or shaky. Saying thank you isn’t hard or time-consuming. Make sure to follow through, ideally the same day as your meeting or interview. A simple thank you can have a tremendous impact – potentially even make the difference between the job or bid going to you or to your competitor.